The Netherlands is a small country, but it always tries to play a significant role, whether it be economically, political or in sports. The Netherlands participated in the introduction of the euro and was also a founding member of NATO and what’s now called the European Union. It’s also famous for its highly open economy which is leaning strongly towards international trade. Every year there are several ecommerce events being organized in the Netherlands. We have a handy ecommerce events calendar, where you can find all the major online retail events in Europe. But you can also check out only the ecommerce events in the Netherlands. Based on data from 2018, The Netherlands has 16.4 million internet users, which represents 97% of the total population. Data from the Thuiswinkel Markt Monitor 2018 shows there are 13.5 million online shoppers in the Netherlands. The Dutch like to pay with iDeal, an online payment method developed by the Dutch banking community. Among the other popular online payment methods in the Netherlands are PayPal, MasterCard and VISA. 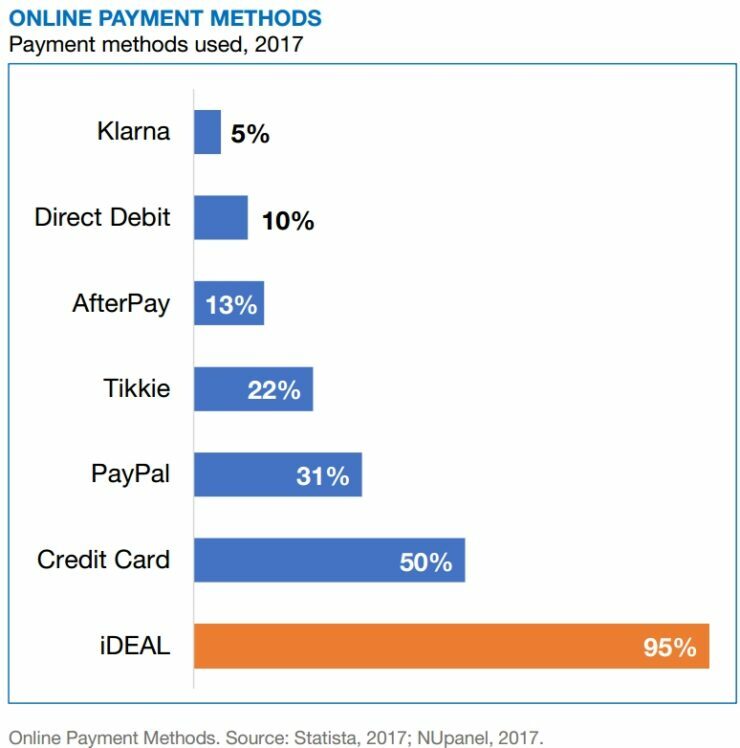 Popular post-payment methods are AfterPay, acceptgiro (giro transfer) and Klarna. The most popular product categories in Dutch ecommerce are travel & tickets (38.96%), followed by telecommunication (12.82%), consumer electronica (7.84%), computer hardware and software (7.57%), clothing and shoes (7.48%) and media (6.36%). In 2018, about 35 percent of online shoppers in the Netherlands used their smartphones to purchase something over the internet. The Dutch ecommerce industry was worth 23.7 billion euros in 2018. That’s an estimated growth of 10 percent compared to the situation in 2017. Online sales in the Netherlands currently account for 9.6 percent of the country’s total retail industry. The biggest online stores in the Netherlands are Wehkamp.nl, Bol.com (the biggest in 2018), Zalando, Coolblue, H&M, Hema and Thuisbezorgd.nl. If you look at this list, it’s directly noticeable that almost all of these are local players, with exceptions for Zalando (Germany) and H&M. Amazon and eBay for example aren’t that big in the Netherlands, mostly because consumers are very hooked on Wehkamp.nl and Bol.com, two players that are online for over 15 years. But also because the Dutch really like to pay online with iDeal, and that’s something those international players didn’t or still don’t offer. April 16, 2019Beerwulf, a Heineken-owned startup that sells beer online, will expand to more countries in Europe. The company will expand to the same countries where home tap retailer The Sub is already active. Last month, Heineken consolidated The Sub and Beerwulf. April 3, 2019There were 5 million Dutch consumers who shopped online cross-border last year. That’s a significant increase of 32 percent compared to the situation one year before, when there were 3.8 million cross-border shoppers in the Netherlands. Together, these 5 million people spent about 880 million euros at foreign ecommerce websites. March 27, 2019Dutch supermarket Albert Heijn has revealed a sneak preview of its latest innovation. The company is working on delivery robots. During this summer, the little robot cars will deliver groceries to customers on the High Tech Campus Eindhoven, home to more than 140 tech companies and institutions. Read all our articles about ecommerce in The Netherlands.